Many beer lovers know that hops and bitterness aren't the same thing – you can get bitterness from several other sources, including herbs and roasted grain, and hops are also important for flavour and aroma – but it seems others don't realise this. Two things brought this to mind recently: first, the claim by US brewery Dogfish Head to have brewed “the hoppiest beer ever documented” when what they meant was the most bitter, and then quite unexpectedly a bottle of Guinness's pitch at the craft lager market, Hop House 13. The latter was developed by Guinness's pilot brewers at The Brewers Project, like the Dublin Porter, West Indies Porter and Golden Ale before it, and like them it has of course migrated to the main brewery for mass production. Hop House 13 arrived as a freebie from Guinness's PR company, along with a suitably-branded glass and even an engraved wooden beermat – there is nothing subtle about the branding here! 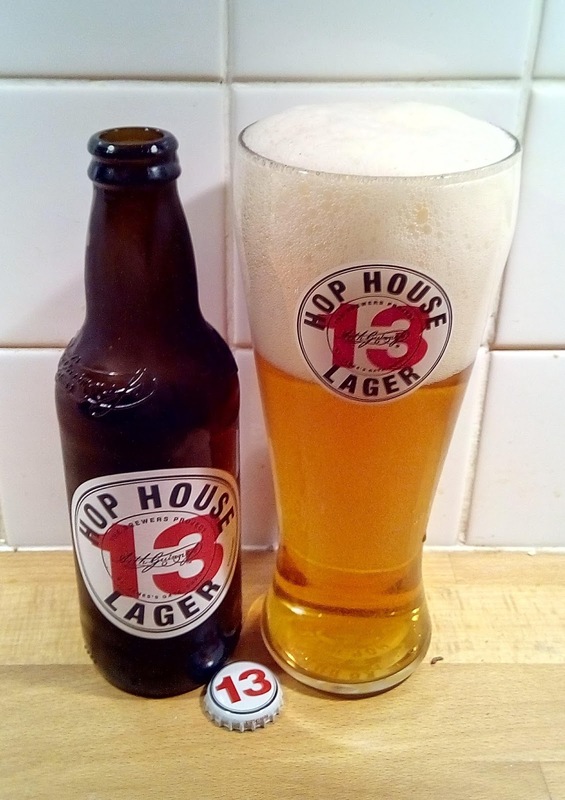 Named after a storeroom at the St James's Gate brewery in Dublin, Hop House 13 has been on limited release for a little while (I'd seen a few mentions from Irish beer bloggers, for instance) but apparently they're now preparing a big push for it. So what's it like, and why the hops & bitterness references? Well, it's hoppy – the underlying beer is a typical malty-sweet Eurolager with notes of sweetcorn, but there's a rich hoppy-herbal layer of flavour over the top, with hints of peach, lemon and hay, and that resinous quality you get from a sack of dried hops. What there isn't is anything much in the way of bitterness. It's pretty good, and rather better than the average Eurolager, but to my palate it seems a bit two-dimensional, as if they've taken a regular beer and layered a swathe of flavour onto it. And after a bit of pondering, I reckon that it shows how the big brewers are targeting craft – in this case, with a flavoured-up beer that is clearly not your average macro lager, yet isn't going to frighten the horses. So while I've had far better hoppy lagers – for example, Trainings Lager from Hannover's Mashsee Brewery, or India Pale Lager from Redwell in Norwich – I can still see Hop House 13 doing pretty well. It's rather disingenuous of Diageo to associate Hop House 13 with the pilot brewery. It's brewed for production in the main brewhouse as a high-gravity beer. It was developed on the pilot kit, but so is every Diageo beer. Sorry, if it read that way it was me over-interpolating. I blame writing late at night, which is about the only blogging time I get! What Guinness actually said was "The new lager becomes the fourth release from The Brewers Project ... a group of enterprising brewers who are on a quest to explore new recipes, reinterpret old ones and collaborate freely to bring exciting beers to life." PR puffery to be sure, but no specific mention by them of the pilot brewery.